The initial source of inspiration to innovate comes in many different forms, but an irate office cleaning lady berating a site manager that “muddy boots were mucking up her clean floors” is the unique origin behind Trime’s brand new product - the X-BOOT. Paul Hay Trime UK’s managing director explains, “We had just finished a demonstration of one of our lighting towers on a construction site and we were heading back to the site offices. As we approached the front door we saw a lady with a mop in hand complaining bitterly that the boot brushes fixed at the door entrance were not substantial enough to properly clean the site workers boots before they entered the office. Deploying the techniques that the Trime development team had used to produce their award winning X-SPLASH Wash Bays, they set about designing a boot cleaning system that no only recycles the water, but will help towards keeping the offices, canteens workshops and inside vehicles clean and tidy. The result was the Trime X-BOOT. The Trime X-BOOT is a footwear wash system that is able to recycle 100% of the water used. Its clever design enables a site to utilise the water many times, whilst the X-BOOTs’ filtration system collects the soil and mud for easy disposal via a removable textile bag. 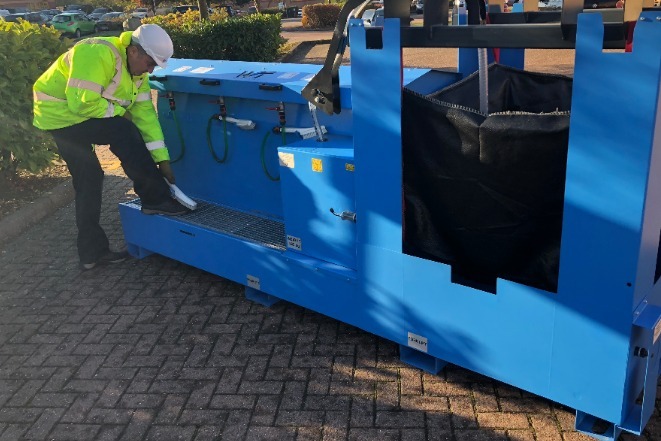 The X-BOOT had been made to collect up to 1000 kg of dirt, mud and other contaminates, saving over 20,000 litres of water per week. Seven persons can use the X-BOOT at any given time, using the handy cleaning brushes to ensure that their footwear to properly cleaned. The X-BOOT operates from safe 110v and can be positioned onto site using a forklift truck or telehandler. It is set up for use within a matter of moments. “With water usage and the appropriate disposal of contaminates being a serious issue, we believe that the use of our X-BOOT will eliminate drainage issues and severely reduce the amount of water used on site,” added Paul. The X-BOOT is currently available for demonstration in the UK and Trime have already had keen interest particularly from some leading construction hire firms. Trime has significant experience in producing energy and water saving products for the UK construction rental markets. Their X-SPLASH Wash Bay has recently been given a Green Apple Award by the Green Organisation. The Trime manufacturing plant is based in Cassinetta di Lugagnano, near Milan and the Trime UK is situated in Huntingdon, Cambridgeshire.